The urgency associated with the speed with which the end of the year is approaching and everything that has to be finalised before then, is keeping all the candles burning here at Grain SA. At the time of writing the rain in the north was scarce and the producers in the south had started harvesting to make sure that all the grain gets into the silos as speedily as possible. It is also a time of extremes – which just increases everyone’s uncertainty. Here and there the news is good – which makes us excited – and then there is the incomprehensible blatant hostility towards the organisation and its members. One such a case was the recent establishment of another organisation for grain producers by a former member of Grain SA’s Executive. This is definitely not in the interests of unity in agriculture, and it is just logical that a race-based organisation will not have a future in this country. It feels like planting time in organised agriculture. Every engine room is buzzing and smoking. The lights are burning until late and we eat on the run. Diesel is expensive and time is limited. Everyone walks an extra mile or two. A large number of meetings are held at grassroots level and emotions run high. People become irritable with one another. In all the chaos the wisdom of Solomon springs to mind: ‘He who is slow to anger is better than the mighty. And he who rules his spirit than he who takes a city.’ The challenge is: How do you remain calm and exercise self-control under these circumstances? It sounds superhuman. Yet it is possible. My advice to you is to go to that place where you can find peace and quiet and switch off everything around you so that you can distinguish between fact and fable. Then you take the facts and set your course for the future. This does not come naturally. Most of us just want to work quicker and harder to keep all the balls in the air. To stop and think is a greater challenge than just again taking a direction without reflecting properly about the course you choose. The Agri SA Congress was one such a ray of light recently. A neat summary of all the Congress resolutions on land passed since 2001 was provided. What stood out to me was the fact that despite all the pressure, we have been extremely consistent through the years. Our leaders kept us neatly in the middle of the road. The challenge now, is to show others where the middle of the road is too, and in that way contribute towards sustainable implementation. It is such consistency that generates respect for an organisation and that causes the country’s political leaders to want to collaborate with us in their search for solutions. This is where patience plays a role: We had to wait patiently for all the noise to die down (we could not participate in the noise). Only then the pleads for collaboration could be heard. It remains a challenge, but it also remains the right thing to do. Prof Quinton Johnson (chairperson: South African Institute for Land, Heritage and Human Rights) also presented us as members of the Congress with an important truth when he said the following: ‘Nothing about us, without us!’ This saying may have been coined by the trade unions a few years ago, but it still applies today – and it definitely applies to us as organised agriculture. Agri SA has positioned itself as an organisation in an excellent way to share in the search for solutions for the future. 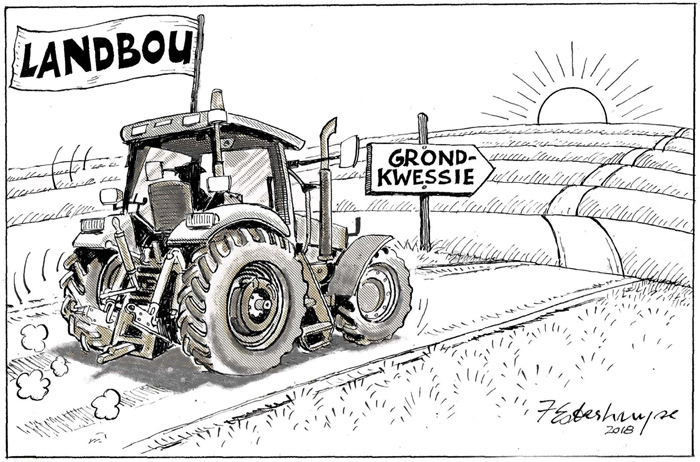 It will definitely not be easy, but my belief in what we stand for and in what Louw Steytler (former Grain SA chairperson) has told us so often: ‘The centre will hold’, has been confirmed once again.